Oil prices, specifically Brent crude oil, have surged since the middle of 2017. Prices are up more than 70%, and some see prices continuing to climb throughout 2018. That may be the case by the end of the year, but for now, oil prices are set to take a dip lower. It’s because this rally in oil prices hasn’t been straight up. There have been plenty of opportunities to take profits, and jump in on pullbacks. That’s exactly what my readers in Automatic Profits Alert were able to do. 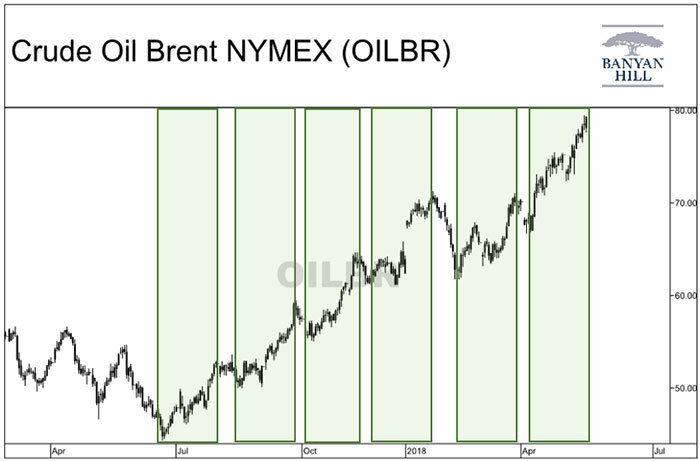 We jumped on the oil prime season earlier this year after one of the easy-to-predict pullbacks, and rode it for a 30% gain in just two months. Each green shaded section is roughly 40 days. That shows a consistent 40-day rally before a pullback since mid-2017. The latest rally is right at the 40-day mark, and I expect to see some profit-taking throughout next week. After this quick pullback, though, I’m not sure oil is heading higher. The inverse seasonal trend for oil prices begins on May 31. That’s when we usually see prices steadily decline for about three months, and it’s the next trend I’ll be looking at to snag another 30% gain from the oil market.